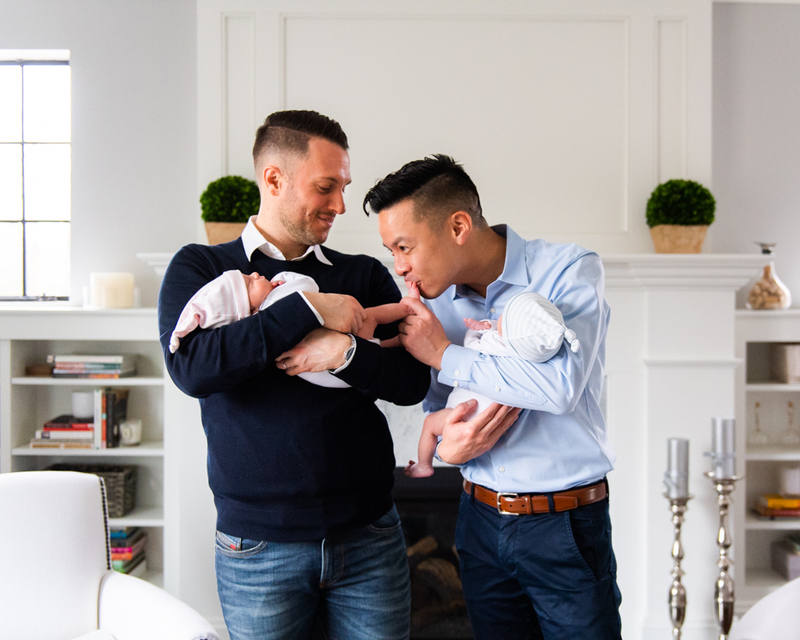 Watching two people step into parenthood is always a beautiful moment, but witnessing two dads tackle life with two newborns made my heart absolutely swoon. Rémy and Adeline were born to Brian and Nic on 12/28/18. Both dads described their connection with the newborns on the phone with me before their session, but seeing it live was simply awesome. Parental intuition seems to come easy to Brian and Nic. Both newborns have such distinct personalities, Rémy preferring sleep and observation, while Adeline was nearly ready to shake my hand when I walked in the door. Babies don’t stay little for long, so I was thrilled to pull back the curtain to memorialize this fleeting time for this family of four. Karen Kelly is an award-winning, documentary photographer in Boston. To see more of her work or connect in person, head to over to her website www.kkpforlife.com or shoot her a note at karen@kkpforlife.com. Special moments in life should be more than just a series of memories…like an engagement, a wedding, or the much anticipated birth of a baby followed by its homecoming. Then there’s the joy of watching that tiny person grow and evolve into a wonderful human being complete with its own unique personality. These are the pivotal processes around which we build the dynamic, ever evolving creations that are family relationships. The series of moments that string together to create a family story that is irreplaceable, special, and one of a kind. You can read more about the philosophy and client service at Karen Kelly Photography online here. It’s always a great privilege using my family, newborn and baby photography in Boston to help families record their life defining moments. I love capturing the essence of these moments and nothing does that more effectively than photos. As a snapshot of an instant in time, photos can be used to build a collection of visible memories. They create a family legacy for future generations by linking our past with the present and the future – a tangible reminder of who we are and where we’ve come from. As a Mom I’ve also come to understand that some of the most precious and fleeting moments in life involve our children. It seems that one minute they’re tiny newborns being welcomed into the family home for the first time then before we know it, we’re welcoming their newborns into the family! Along the way, even though time flies past, we create the millions of memories that make up a family story. Click here to see more beautiful family heirlooms Karen Kelly Photography has created with clients like these. Capturing these moments and turning them into something more concrete than fleeting memories is so important yet we allow so many of them to pass us by without doing that. This is why I feel so blessed that by offering family, baby, and newborn photography in Boston I can contribute to documenting those irreplaceable moments, like attending a wedding or bringing a newborn home for the first time. I also love nothing more than being involved with a family as they grow, so when I was asked to photograph baby Zachary on his first birthday, I jumped at the chance. And what a first birthday it was too. Zachary may not remember any of it when he grows up but he’ll be able to relive it through these photos. That’s priceless and just one of the many reasons why I’m proud to provide baby photography in Boston. Whenever I’m asked to join a family to share in and help them record the unique moments that are part of their evolving life story, I’m always deeply honored. These moments of love, joy, and happiness are what make family relationships so special and I love being part of them. Over the years I’ve been very privileged to connect with some amazing families through my family photography in Boston. In some cases I’ve been super privileged to have witnessed not just one milestone in their family history but have been welcomed back to record more of their life story for them. That’s the sort of connection I thrive on! That and helping these families create their own visible connections between past, present, and future. Turn the past into a visible part of your present, and your future. Through unique family, baby, and newborn photography in Boston I capture the true essence of your ‘today’ moments and preserve them for life. If you’re looking for wedding, newborn, baby, and family photography in Boston please contact me. I’d love nothing more than to help you record and create a gallery of your family’s most important stories so they can be cherished today, tomorrow, and all the days after that. Don’t let your special life moments become just a series of memories…. One sunny morning in May, I sat with Jennie over coffee to learn about the many layers of the people she loves most. She had just gotten a new puppy, and the friendly nibbles under the table was the perfect foreshadowing for my favorite type of family session – playful mayhem. During this hour long conversation, we dove into her and Matt’s love story and how they’ve worked together to create a family that values togetherness above all else. It enabled me to see her daughters not just as smiling faces, but as loyal, driven, shy, curious and incredibly athletic women-to-be. Most importantly, I saw all the dimensions of Reese, Finley and Teagan through Jennie’s eyes. Reese, their first born, takes on the perfectionist role, always seeing her duties through and passionately pursuing swimming despite being the youngest on her team. Jennie also talked about being able to have conversations with her that go deeper emotionally and intellectually than her younger siblings – a level of understanding that’s exclusive to the two of them right now. Finley, their middle daughter, has a loyalty that shines through all her relationships. It’s Finley that holds the sisterly team together, bridging the gap between big sister Reese and baby sister Teagan, melding interests and always finding ways to make their interests dovetail. And last but not least, Teagan, whose spunky nature drives her to be quite the competition for her big sisters, always pushing to match their accomplishments – and then some. But in her quieter moments, Teagan still loves to crawl into the living room chair for a cuddle with mom each afternoon. The push and pull of still being a toddler. So why do all these hallmarks of each child matter? Because every daughter is unique, every son is unique, and every relationship they have to their parents is unique. When I understand who your children are beyond a name and age, I begin to see them as you do, and that translates to photographs that look and feel exceptionally distinct to each family member. Maybe most importantly, it allows each child to shine on their own – to see their unique place within the family unit as extraordinary. I was so happy to have all three girls join Jennie and Matt when I presented their photographs. As the images faded in and out on the screen, I watched a tear slide down Reese’s cheek. This was one of those electric moments where I realized how much she could understand emotionally about the connections in these photographs. My hope is that it created a warm, happy place in her memories – a reminder of how deeply she is loved and the culture of family she’s been lucky enough to know. Katy and Doug called me for a maternity session at a very unique time in their lives. They were in the middle of transitioning their lives from Boston to Chicago, and wanted to capture the details of their daily life in Boston. They desperately wanted their first child to know where their story began, and to share this story with their new world in the midwest. Katy and Doug meet every night in the Boston Garden on Doug’s way home from work, and sit on their favorite bench to catch up on everything they’ve missed while they’ve been apart. Their apartment is a block off the Garden, (where they got engaged) and they love staring out the big windows watching the sunset whenever they can. Katy loves Doug’s distinct gait, his disarming kindness, how dedicated he is to her and their future. Doug he loves Katy’s hair, and how she has become his best friend, his ultimate comfort. They want to raise their children to be open- minded, curious and hard-working. When I set about photographing them, I wanted to make sure I captured the sentiment of everything they shared with me. So we started with a meet up in the Boston Garden, and took it from there. **Meet me at the end of this post to see the incredible wall designs they purchased for their new home. This is their favorite bench that they snuggle on at the end of every day. I wanted to make sure that we got a great sense of location, so I made sure the skyline made it’s way into these photographs. The expansive windows in their unit threw some beautiful golden light our way as the sun was heading down that evening. Katy and Doug got engaged on their bed, so we hopped on and took a few frames of them reliving that moment for me. Their past, their future, in one fleeting moment. At Katy and Doug’s design consultation, they decided to purchase two collections for separate spaces in their home – a vertical space in the living area, and a larger space in their master bedroom. I love how both collections share different details of their family story, and allow them to display the photographs in both public and private spaces in their home. Karen is an award-winning photographer specializing in documenting and preserving family history. You can see more of her work online at www.kkpforlife.com, on Instagram or on Facebook. She would love to get to know more about YOU! If you’d like to contact her directly, you can find her at karen@kkpforlife.com.